According to OSHA guidelines, a hardhat or helmet must be worn by tower climbers to prevent injuries. So you put one on, wear it and call it good, but it really doesn’t end there. There are common mistakes made that can limit the effectiveness of your helmet. These mistakes aren’t just made by novices or newbies, some are made by people who have spent their whole career under just such a helmet. 1) Helmets don’t have expiration dates.- This is false. Even if your helmet has never suffered from a break, a fall, or a crash, there is a limited lifetime for the use of your helmet. The plastic, foam, and other components begin to break down with age. As a good rule of thumb… if the helmet is bought from a retailer, it should be discarded before five years passes. Some will even say that it should be five years from a manufacturing date. Of course, this is for helmets that are properly stored and kept in a climate controlled environment. 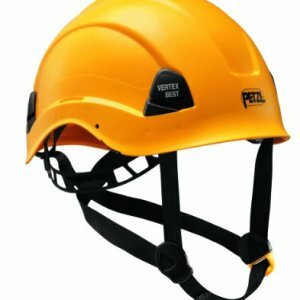 For tower climbers who are out in the elements the helmet suspension should be replaced yearly, while the shell will be fine following the five year guideline. If an impact has occurred, then immediate helmet replacement should happen. 2) A baseball hat can be worn as long as the bill is backwards.- The lining of a helmet is designed to fit a human head. Even if the bill of a hat is turned backwards, the helmet will fit improperly. This leads to an increased risk of it falling off, which according to Murphy’s Law will always be at an inopportune time. This also limits the suspension provided by the helmet, which simply means that if anything falls on your head, there is a greater chance that the object will have contact with your cranium. There are special shades and head warming gear which are specially designed to NOT reduce the effectiveness of your helmet. 3) I can wear my hardhat backwards.- This one is actually true, at least for type 1 helmets. The suspension layout is essentially the same in both directions. At most the forehead strap will need to be moved forward in order for the proper resting position on the head. It is important to note that type 2 helmets have a more complex design. Thus, wearing these backwards will dramatically reduce the efficiency of the helmet. 4) I am a big fan of _____ band or team, so I’m going to show it by placing stickers on my helmet.- As it turns out, this is mostly okay and will not affect the effectiveness of your helmet. Be sure however, to check with your company about their policy. Stickers can cover cracks, dents, and/or scratches and therefore are discouraged by some companies. The adhesive used in most stickers is not likely to affect helmet stability. Even with this being the case, stickers must be at least 1/2 inch away from the rim to maintain structural integrity. 5)What about painting it?- This is a resounding NO. While adhesive stickers don’t affect the chemical composition of the helmet, paints can. They can literally attack the shell of your helmet making it look nice, but be utterly useless. So save your team colors for your day off.